I'm looking for a small world seed! With a lot to offer, of course. So please post away with your favorite small world seed, and tell me what it has to offer! Just started playing on a SMALL world seed "Pumpkinhead!" I think I've seen similar named seeds before but this one is epic. I was about to post it up when I saw this. You start on a small jungle island with a larger long thin one beside it. There is 2 villages within view. One desert, one plains (with blacksmith). There is a desert temple within eyeshot of the desert village. As a bonus the end portal can be seen from the water when sailing north of you spawn island. It's literally exposed within 60-70 blocks from you spawn point off the edge of the larger island. If you dig down from the centre of your spawn island you will find under ground ravines that eventually lead to an abandoned mineshaft! there are some exposed diamonds at the bottom and some hidden behind gravel. Don't have coordinates but when you see a large water fall (actually the ocean falling down) from the mineshaft it's close by. Best Seed I've found so far. First seed that allowed me to complete K1's 20k sorting system properly thanks to the ice spikes biome and ocean monument. Even contains a small bit of redsand near desert temple for those that want to use some sort of sand conversion technique. If glitch no longer works, there are plenty of full red deserts once you switch to medium or large as well as off-the-wall goodies like podzol. Has Mushroom biome right near ocean monument for those that like to play it safe. edit: Forgot to mention the villages near start but you'll see them if you watched first vid. This small world has 4 villages (one is tiny, but still has a blacksmith), 3 desert temples, 2 woodland mansions, and 2 ocean temples. The ocean temples are not deep, one is literally 1 block from water surface. It has 3 mansions ( 1 is partially built), 4 villages, lots of deep caves etc and plenty of resources. I've attached a JPEG image, hopefully you can view it. I really hope you all enjoy it. :-This next one is a small map but has vast resources, essentially I had enough resources to enchant everything, build a multi track cart terminal and have tracks going all over the map, multiple villages barricaded against enemies and so on. " star wars" as the seed, or its numerical seed is " 2089131929 "
:- a 7 village map "132376"
I find that on console I prefer the small map as you can get it all on one screen ( easy for editing then printing) and you can't get lost for long. This is one of the maps I started and completed by killing the Ender Dragon and proceeding into the nether realm AFTER defeating the dragon. But I consider the map finished when you defeat the Ender Dragon. Water temples are an utter wast of time in my opinion as they only hold a few blocks of gold at their heart and are just grief to get to and dig through. If anyone has small maps on the console versions of Minecraft ( PS4 & xbox one) please share them, I'm always looking for a decent small map to play around with. One of the major benefits of the small map is of course, that you can build a minetrack all around the edges or zig zag across the map or simply build across the middle of the map, making all locations that much easier to get to. I usually scout the map out in creative mode and note all the relative co-ordinates, then delete the map and make a survival map, switching between "peaceful" and "easy" mode depending on if I'm mining or hunting mobs like the Ender Men. 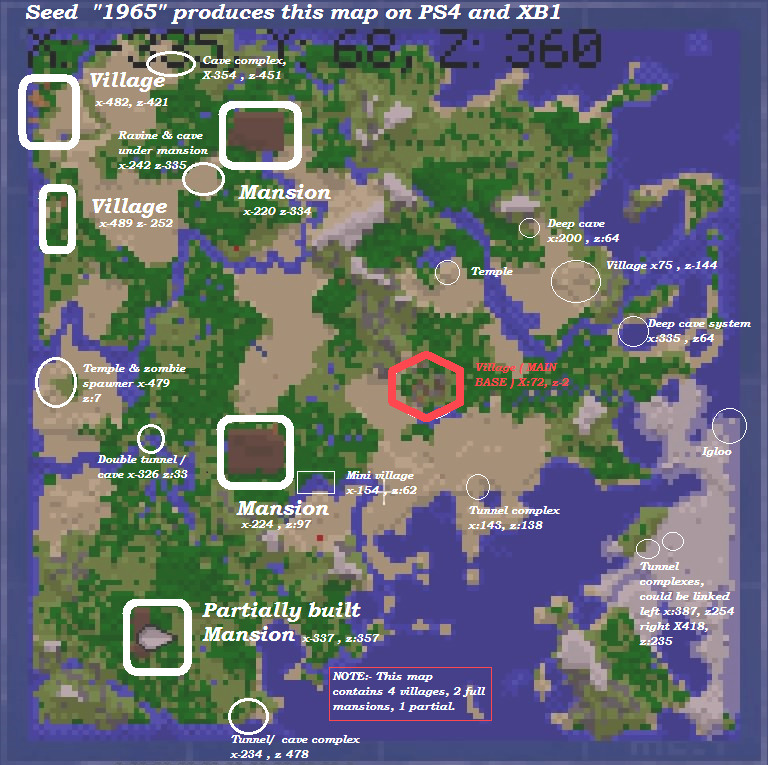 All the above maps re-tested 17/01/2019 to make sure they work on the final builds of Minecraft for PS4 and XBOX 1, haven't tried them on Vita, Wii-u , Xb360, ps3 ,Switch or the " Better Together" edition which essentially sets your world map to infinite ( I think) so is a bit pointless really. I think a game like Minecraft needs physical boundaries to enjoy it more. The seeds in this post also do not appear to work on the PC Java version. All the best, and have fun.